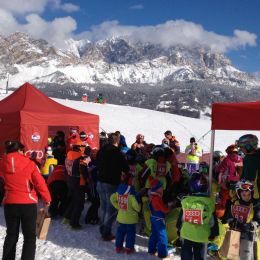 The participants of the 4th Cortina's World Snow Day spent a beautiful winter day with bright sunshine and nice warm temperatures. Due to the lack of snow (it snowed only 2 days before!) part of the program scheduled had to be slightly changed, but this didn't prevent the children to have a good time. Early in the morning almost 200 kids arrived with their parents and ski instructors on the well prepared baby slope of Socrepes. All the kids took part with good will at the various educational and recreational activities provided. Everyone was welcomed with a bag with tasty snacks and free gadgets. - a speedy ride on snow with rubber dinghies. During all the day a dining tent with free drinks and snacks offered by our partners was made available on a nearby area with a nice rubber slide accompanied with DJ music all time long. Before leaving a draw gave price to everyone, among them two kids won a tandem paragliding tour in Cortina to see the slopes like birds. At the end of the day the more skilled kids on ski moved to the finish area of the Ladies World Cup Downhill Race in Tofana, they saw the last athletes coming down from the tribunes and finally they joined the ladies under the podium with a great joy, asking for autographs and taking pictures with them! 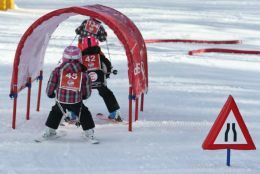 All families were excited to spend a funny day on the snow with their children! It was indeed a great day! The pictures and the video show the enthusiasm and joy that pervaded this day.